And Stu so Decided: Have you seen this IOU? My boss is frugal. That's all there is to be said about it. 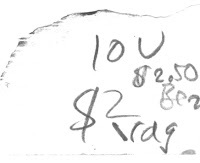 One friday evening at beer O'clock, he didn't have the money for a beer, so he left me an IOU ($2). Upon hearing this, a co-worker payed $2.50 for it. Its now negotiable tender in our office.